Business cards were first developed in 17th century Europe as a way of building social connections amongst the aristocracy. 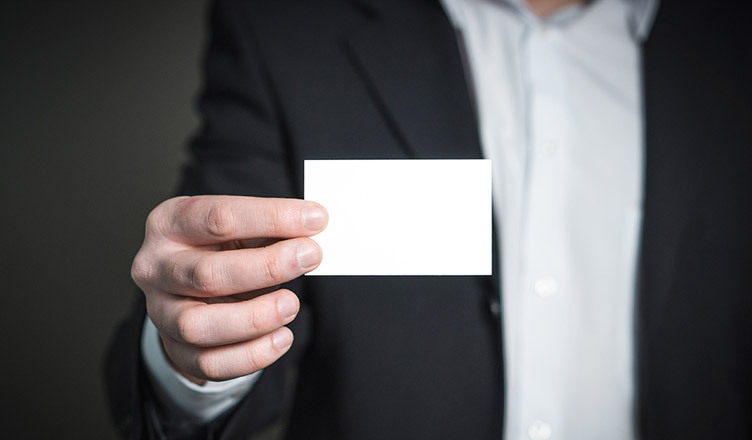 At the dawn of the industrial revolution, business cards came into prominence as a way of business owners building connections throughout the world. However, the 20th century is generally regarded as the ‘golden age’ of business cards, particularly in the 1980s. Around this time, entrepreneurs were increasingly becoming global, one moment they would be in Tokyo, the next in New York, and then London the next week. Without the internet to look up a company’s details or readily available foreign business directories, international business people would carry business cards as a matter of necessity. Now, in the internet age, business cards have lost some of the importance that they once had. If you forget to bring your business cards to a meeting, your company details will be a fairly easy Google search. A lot of business connections nowadays are made online rather than in person. This has led many, especially amongst the younger generation, to believe the myth that business cards have lost their purpose, whilst they were once seen as an essential accessory for any would-be entrepreneur. Perhaps we are a far cry away from the kind of business card obsession that was found in the 1980s highlighted by the film American Psycho’s ‘business card scene’. However, entrepreneurs continue to hold expectations from other people to hold business cards, therefore it would be wrong to assume that business cards have now become redundant. The people who quite often buy into the idea that business cards have become redundant are quite often entrepreneurs from the younger generation, because they’ve grown up with technology and the internet along with social media. The problem with this phenomenon is that it does not consider the fact that the vast majority of decision makers, investors and company owners are of an older generation simply because it usually takes a lot of time to reach this kind of position. However, there is still a level of expectation for an entrepreneur to carry a business card, it demonstrates credibility, authenticity, drive, determination and professionalism. If an entrepreneur has the foresight to carry a business card in the case of a chance encounter, they are likely to be prepared to deal with the various other challenges that carrying a business card brings. Some would argue that as now that the vast majority of people carry smartphones, business cards are not really that important, you can just add a potential prospect on LinkedIn right there when you meet them. The first problem with this is that it does not have the same personal connection that a physical business card will have. If you just add someone on LinkedIn or send them an email, it doesn’t carry the same aesthetic value a business card does. Another factor to remember is that you’re unlikely to have the time to pull out your smartphone in many situations, if you find yourself in a chance encounter with a prospect in a rush, if there are tons of entrepreneurs just like you trying to get some time with a decision maker. Of course, a way around this is simply finding their social media contact. But if they’ve met a lot of entrepreneurs that day, it is unlikely that they’ll remember you. A well-designed business card will stand out, it will convey the message of your brand and it will leave a lasting impression to any prospect that receives it. Business cards are also a direct form of marketing that cannot currently be replicated in any format; they are cheap, and you can pretty much leave them anywhere. A lot of public libraries allow you to leave business cards for anyone visiting to have a look at. You could leave them in foyer of a major office block that holds several businesses, you could post them directly through letterboxes to targeted businesses, attend business fairs and business meetings such as those as featured on meetups.com, and hand them out to multiple prospects all in one quick sitting. You can also give business cards to key employees such as your sales & marketing team, meaning that you have several representatives all of which can hand out your business cards when they happen to encounter a prospective client, when they’re at some industry exhibition, or if you send out your salespeople on one of those old-fashioned door-to-door calls at various business offices. Digital marketing, on the other hand, hasn’t got the same physical advantage: while a prospect may see your company online, they can easily go on to another website and forget all about yours. If you’ve given them a physical business card, it is something that they can see right in front of them and they’d have to consciously get rid of (if at all they want to). It may even end up in a pile of other business cards. But, that prospect is likely to be exposed to your card for a longer period of time than they are with digital marketing. In a world where even a small business can often need to spend £1000 per month on Google search engine marketing, platform print marketing and specifically business cards remain a cost-effective ROI, not to mention a dainty personal touch. Mary Cochrane runs a graphic design business based in Glasgow called Busy Prints. Busy Prints provides businesses with leaflets, menus, business cards, posters, banners and calendars.